Royal Mail is pleased to announce that Post and Go machine A007 will go live at the Royal Navy Museum of Naval Firepower in Gosport, Hampshire on 16 August. The machine will vend Union Flag and Machin stamp designs and carry the 'Royal Navy' identifier. According to the RNMNF website, the Museum Shop is located "opposite our Reception area and stocks a wide range of Souvenirs and Books relative to the Priddy's Hard site and Naval Firepower. "Publications and souvenirs can be obtained from the Shop via Mail Order, please contact the Gift shop manager by phone on 02392 505612 or Contact Retail & Coffee Shop to discuss availability and current prices. "The Camber Lights waterside coffee shop, is FREE to enter and can be used independently from the Museum." machines will carry the Union Flag stamps from 1 August until 13 September. Royal Mail have said that the flags should be nationwide by 10 August. Several people have reported that there is no sign of the Flag stamp at any Post Office branches yet, although with Royal Mail announcing that they 'should' be nationwide by 10 August, it wouldn't be unreasonable to think that some might have arrived already - or at least that the parties involved would know they were coming. This tale from S is at the extreme end of customer experiences, but maybe that is his persistence in trying to find them. Had a very frustrating morning today. Started with a phone call to Stockport Post Office to make sure they had the Union Flags in their P+G machines, no was the reply. So then I tried the Stoke on Trent PO; no was their response the next ones are the Ladybirds, nothing till then. I mentioned the Royal Mail(RM) Post and Go website and they suggested I phone the PO help line, that’s where they get all their info from. Phoned the PO help line they said did not know anything so I should contact the RM help line. Phoned the RM help line, knew nothing, everything comes from the Philatelic Bureau – Tallents House (TH). Phoned TH and after about 15 minutes wait they answered, I think it was a Polish man who answered, he knew nothing and was very rude, so I asked for a Manager, none available, eventually he took my phone number and promised to get a manager to phone back. Later, he phoned back stating “The machines are in Rio and stamps only available from Rio”. I explained that was not true and demanded to speak to someone else. A man called Jim came on the line and I went through the story again, he did not know but promised to find out and come back which he did about 15 minutes later – there is a delay in printing the rolls of stock and would not be issued until Wednesday 10th August. 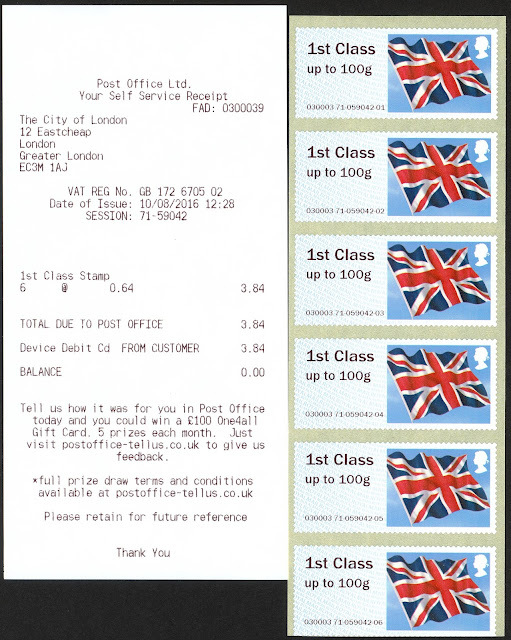 Given that the decision to have these flag stamps available was made by Royal Mail, why should collectors be the only ones that know about them? Surely they told Post Office Ltd what they were planning? If they didn't, why not? If they did, why didn't POL tell the branches that would be affected? Why does the Royal Mail helpline not know about the philatelic programme and about these special arrangements? Knowing that collectors are sometimes confused by rumour and by forgetting exactly what they have read in magazines and blogs - and would therefore eventually phone somebody at Royal Mail - why not tell the Royal Mail helpline call centre? Especially given the problems at Tallents House - the last thing they need is more confused collectors telephoning about something that will be mainly in Post Office branches, and which won't be handled by the philatelic service. For a company specialising in communication there are woeful holes in Royal Mail's own ability to communicate to its own staff and its partner organisations. Since writing this, ie in the last half-hour, I have found an update on the Royal Mail Post and Go page which now says that the stamps will be in their Enquiry Offices from 1 August (ie already), and in PO branches from 10th. Doug reports that the Flags were loaded into machines at Eastcheap (London) after he asked for them! (See below). Meanwhile we've realised that as Norwich Castle Mall Crown Office is relocating to WHSmiths, today will be the first and last day for the 190003 branch to have the flags back. Coinciding with the 80th anniversary of the Edward VIII 1d value issue and the first day of Autumn Stampex, a new overprint will be available from the Post and Go+ machine in The Postal Museum foyer and will feature on both 1st and 2nd class Machin reels. In addition to The Postal Museum logo, the overprint will feature a graphic illustration of the royal cipher for Edward VIII, as designed by him and used on royal household mail, as well as the text "King Edward VIII 1936". The stamps will be available from The Postal Museum foyer during standard opening hours from Wednesday 14 September until close on Friday 11 November, replacing the normal Machins. The Union Flag and Mail Coach designs will continue to be offered with the present overprint and will not change. Just to save anyone travelling to get the flags reissue on 1st Aug, i have been today 27th July asking about flags in 2 suburban London offices, neither offices had them or knew about it. So looking good for a usual right hand does not know what the left hand is doing. I questioned Royal Mail, in light of your comment, and was told that they should be nationwide by 10 August. I to have visited my main office that have NCR Post & Go machines and they have had no stock of the Union Flag stamps so will not have them ready for Monday 1st August. In fact I was told today that they did not even know anything about it. Reading this about waving the flag for Rio.Unless there is going to be an overprint on these,there is nothing to distinguish the fact as to why they are issued. Ah, but you are thinking from a mint stamp collector's viewpoint! Royal Mail have made these available so that people can use them during the Olympics, and to perhaps make their own commemorative covers when Team GB wins Gold Medals*. reply to Fireman Sam is...the flags have never previously been readily available in NCR machines with only remnants of old stock used by offices that upgraded from Wincor to NCR....the MA13 version is yet to be seen in NCR(all previous branches stocks were 'undated'. this will also allow collectors of 'open values' to add to their collection IF THEY WANT TO! Thanks Anon; I must admit to being less than enthusiastic about Post and Go these days so I had overlooked that. Oh well, a whole new collectable then. I am looking at the illustration of the new overprint on the Postal Museum Post & Go strip to be issued on the 14th September and was wondering what the ERI in the box stands for? Maybe I am missing something. That will be Edward Rex Imperator - King Emperor. Had me wondering for a while, too!